No experience needed. Beginners Welcome! 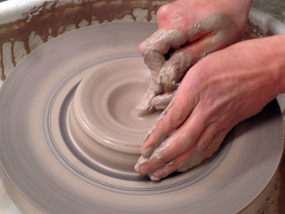 This wheel throwing class will introduce beginners to the basic skills used at the pottery wheel. Each class will begin with a demonstration followed by hands on instruction. At the end of the course students will be able to create simple forms at the wheel. Items will be glaze fired and ready for food! In this six week course we will learn about: thrown cylinders, bowls, trimming, attached handles, and glazing. Class 1: Wedging your clay. Demo: centering clay on the wheel for bowls. Students will begin throwing on the first night. We will focus on centering clay on the pottery wheel. Thrown bowls will be saved for trimming. Class 2: Centering clay for cylinders. Demo: cylinders, trimming bowls. Thrown cylinder shapes will be saved for handle attachments. Class 3: Handle attachments. Demo: pulling a handle from the form. Work on prior projects or practice some forms we have discussed. Free day. Class 4: Glazing the pot for food use. Demo: glazing in the studio. This class will be spent discussing glaze and application. Students will glaze their bisque ware. Class 5: Throwing larger forms and pulling a spout for a pitcher. Demo: pitcher form. Continue glazing. Free day. Class 6: We will discuss our glaze fired pottery! Demo: thrown plates. Free day to finish up any unfinished projects.